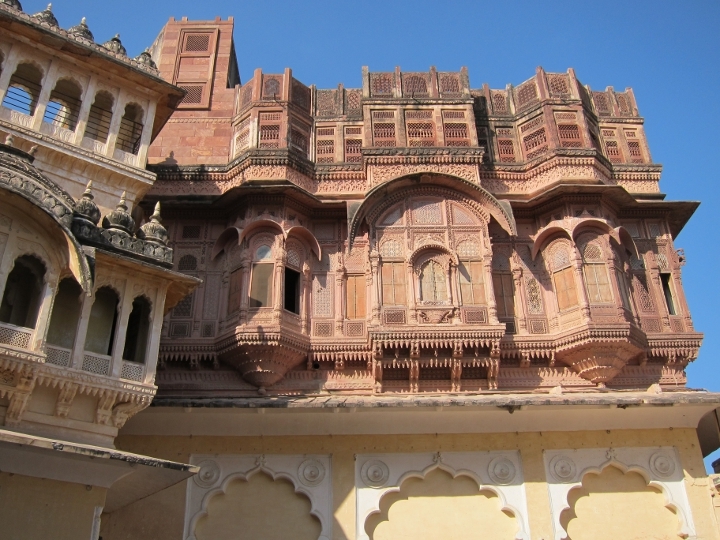 It’s the 18th of January 2011 and after a bus ride through Rajasthan we have arrived in the state capital of Jodhpur. 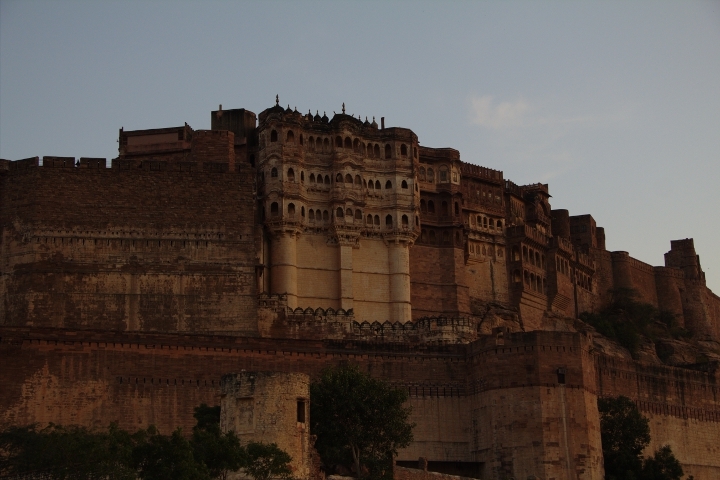 With six hours to kill before our train ride to Dharamshala we have put our bags into storage, hailed some auto rickshaws and are on our way to the majestic Mehrangarh Fort. Winding our way up the long road which leads to the fort, I see it looming high above me, tall and proud (see picture above). On my lap sits my trusty recording rig. I’m not sure what, if anything, there will be to record at the fort but best to always be prepared. In the auto with me sit Scott, Wyatt and Mick and as we drive along fierce debate rages on the definition and credibility of pop music. Trying to get off the subject I ask whether they think there will be any cannons at the fort, you know, being a fort and all. Wyatt is quite adamant there will not be. Reaching the fort we pile out of the auto, paying the driver then gathering with the other members of the GE-OS crew. 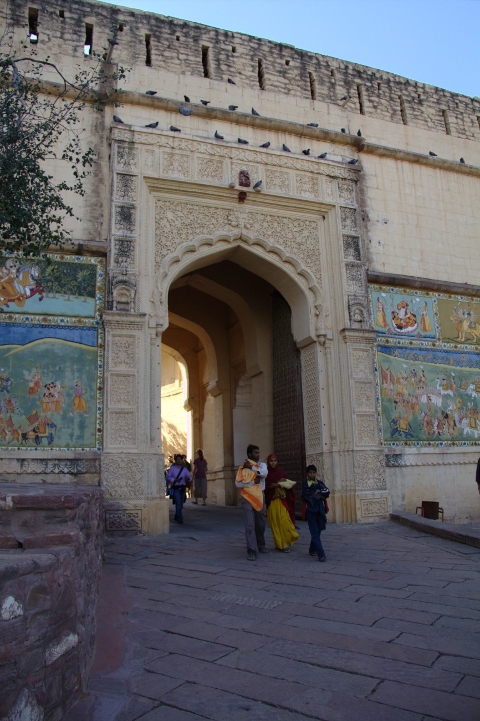 Before us stands the elaborate entrance gate (see picture to left) adorned with colourful intricate artworks. Walking through the gates I’m surrounded by the reverberant sound of birds chirping. Looking up I see the ceiling of the archway is covered in small, mud, bird nests; tiny swallows fly between them to their young. I want to stop to make a recording but there is a high level of background noise from all the passing tourists and we’ve only just arrived so everyone is hurrying to pay and get inside. I walk on making a mental note to try a recording later in the day. Paying my entrance fee I’m handed a small electronic device and a pair of headphones; our guided audio tour. Placing the headphones on I hit play on the first track and am quickly bored by monotonous dates and figures as I wander along the wide stone streets of the fort. Stuffing the headphones into my bag I continue on unaided. Passing through another large archway I emerge in a clearing to the sound of a man singing and playing an unfamiliar stringed instrument. I walk towards the man and stop to listen amongst a small group of tourists who have also gathered. It is a sound unlike I have heard before and as soon as the song ends I approach the man to ask if I may make a recording of him. He graciously agrees and I begin to unpack my rig as he plays another song. I throw on my headphones and pull out the Rycote windshield which houses my Schoeps MS pair. Turning on my Sound Devices 702 recorder I adjust my gain levels and set to work finding the best position to record the performance. Listening intently I move the microphones up and down, back and forth, holding the pistol grip in my right hand. I’ve decided not to use a stand for this recording and just freestyle the mic position. This allows me to move and adjust the positioning during the performance, compensating for changes in volume and arrangement of the song. 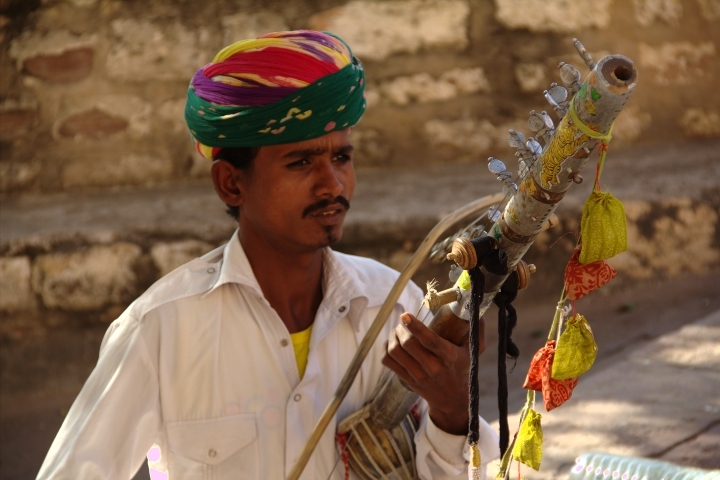 The sound of this instrument, the ravanahatha, is so unique. The way it resonates almost sounds like it is being played from inside a tin can. Then, as the player strokes the bow back and forth, the bells attached to the top of it shake and jingle in time with the song. It’s fantastic! Although at the time the crowd that gathered around while I was recording were quite annoying, listening back now I don’t mind the sound of them chattering away; it sets the scene quite nicely. I also quite like the sound of the radio that goes off from the left near the start of the piece; it was almost perfectly timed to fit in with the song. As for the recording itself I must say I am very happy with it. The focus between the ravanahatha and the vocals shift quite nicely and the sound of everything shines through beautifully. I just wish I knew what he was singing about! 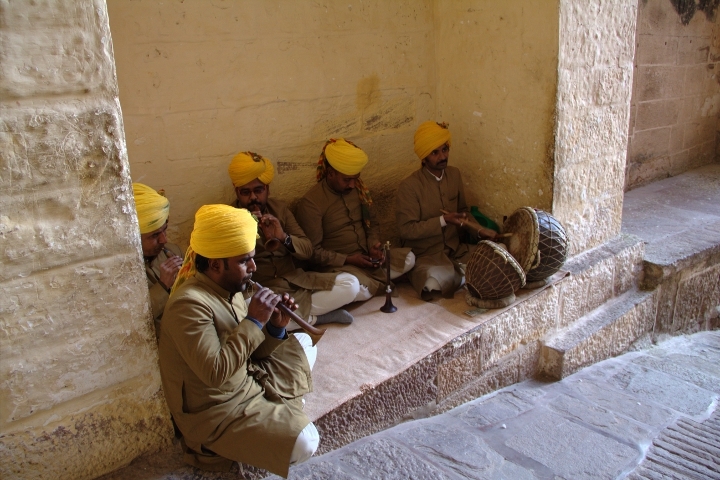 …Sliding the bow back and forth the man plays as I watch and listen, making slight adjustments to the mic positioning. Whist he is singing I angle up towards his mouth. 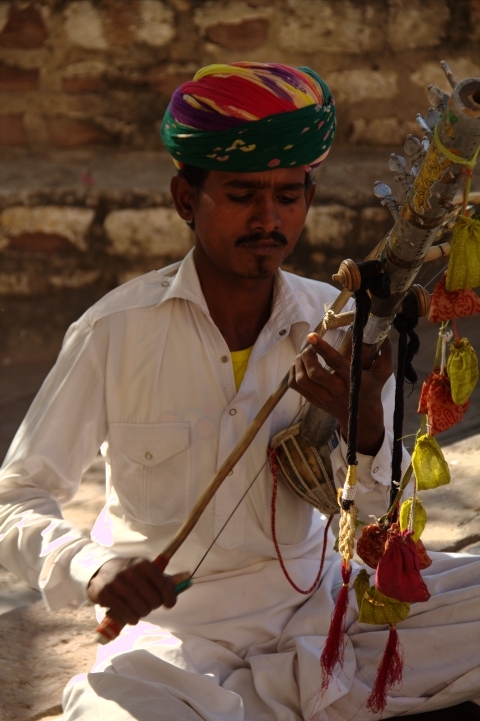 Between lyrics I angle the mics down towards the ravanahatha as he plays. This allows me to keep the primary focus of the arrangement on axis. I realise that quite a large crowd has now gathered around to watch what I’m doing, so once the last note has rung out I hit stop and pack up my rig quickly before people start enquiring too much. I rise from my seat and thank the musician for performing for me, paying him a generous tip. Throwing my bag back on I make my way through the crowd of locals and tourists and continue my adventure through the fort. Walking up the long stone streets that wind through the fort, it’s hard not to stand in awe of the intricately carved stone work that make up most of its walls. The time and precision that would have gone into something like this just blows my mind. I finally pull myself away and continue on. The five musicians blow their horns as I record. Every time I listen to this recording I find myself smiling. It’s such a happy, joyful sound and almost funny. I love when the horns come in together in chorus; it really is almost comical. The stereo image of the horns is also quite nice, if a little left heavy. At the time this was done on purpose to keep the vocals more central but now I think positioning myself a touch further left may have been better. …As the horns blow and the drum is beaten I can’t help being reminded of the Mos Eisley Cantina scene from Star Wars. It’s a very fun and energetic performance and, thankfully, one that doesn’t draw another large crowd! Being in such a reverberance space as this stone tunnel, any chatter from nearby tourists would have been horribly amplified and potentially ruined the recording. The final note rings out and once the reverb tail fades to silence I hit stop on my recorder. Packing my rig away I thank the musicians and pay them for their time. I start to leave when they call out to me, indicating that I have not paid them enough. I smile and say sorry, continuing on my way. 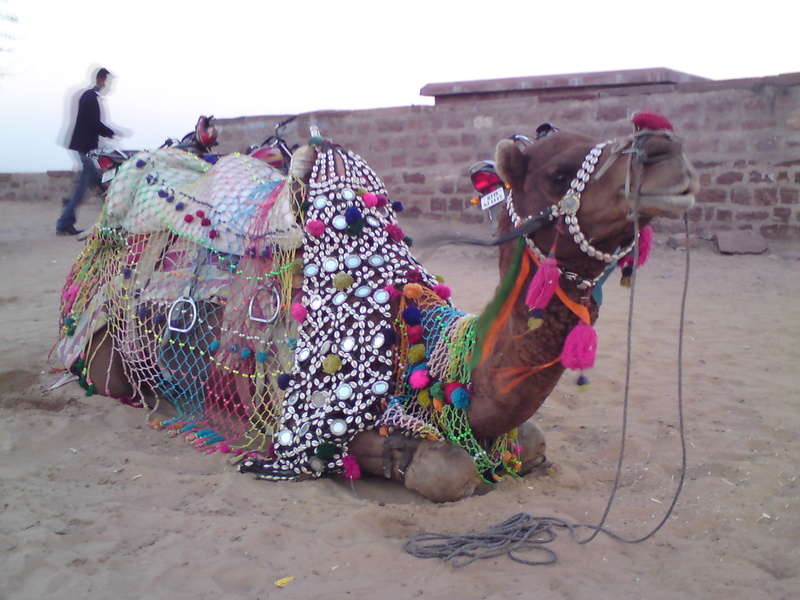 Really, I didn’t have to pay them at all; they are paid by the fort as a tourist attraction. And what’s more, I paid them more than a day’s wage to play me one song! 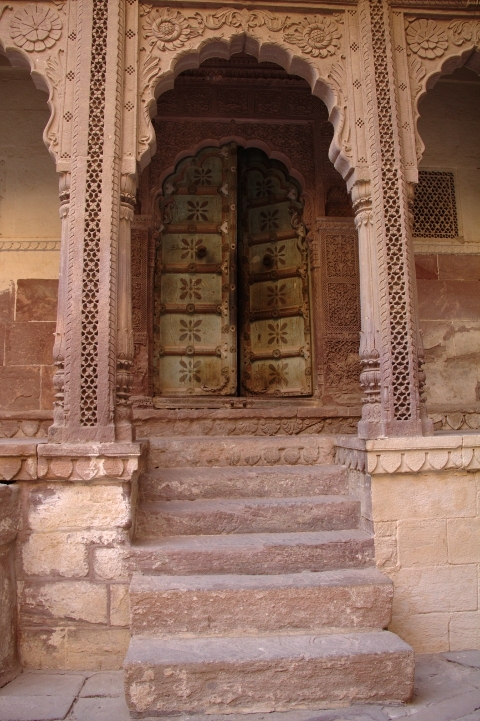 A door to one of the exhibition rooms. 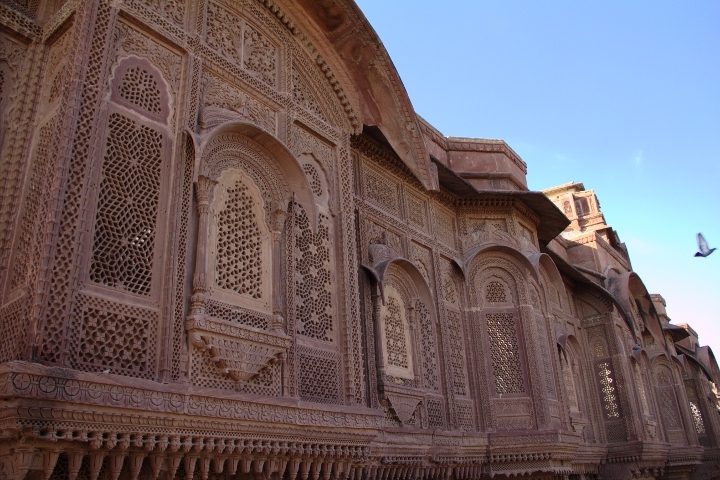 Exploring the great fort I come across many rooms filled with artworks, weapons, intricately carved jade sculptures and chariots, amongst other exhibitions. I can feel myself being immersed in the history of the place and am completely fascinated by the unique pieces on display. Working my way through the fort is a bit like a maze and I quickly realise that if I hope to see it all I better pick up the pace! Emerging from one room I find myself at the start of another clearing, towards the top of the fort. A large dirt covered area expands before me with a few dry trees dotting the space. Gazing around I can see a few locals going about their day; hanging washing and cooking meals. I look up to see the turrets of the fort standing just above me and begin making my way through the clearing towards them. One of many cannons mounted atop the fort. As I walk up a set of stone steps to the very top of the fort something catches my eye up ahead and a large smile crosses my face. Climbing the final steps I approach the black object before me and can’t help let out a laugh with smug satisfaction. 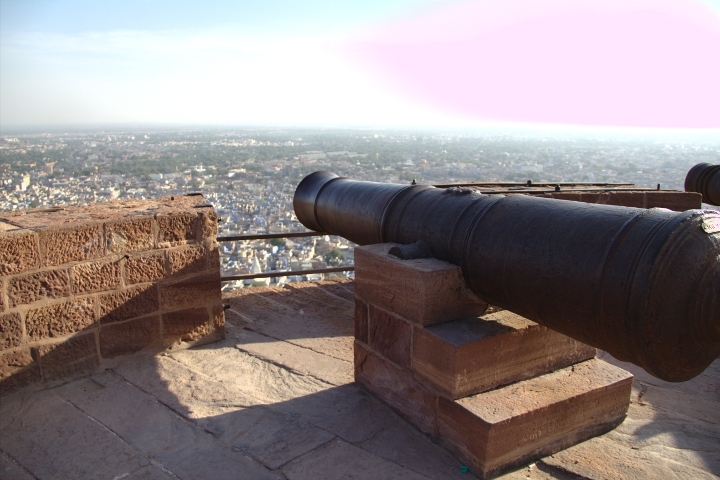 There is a large black cannon, mounted between the turrets of the fort, overlooking the city below. It is in fact one of many cannons scattered about the top of the fort! 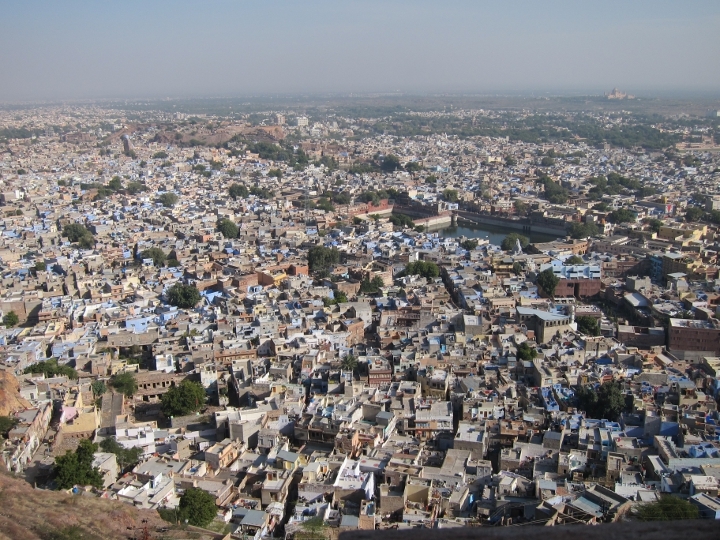 The city of Jodhpur from the top of the fort. 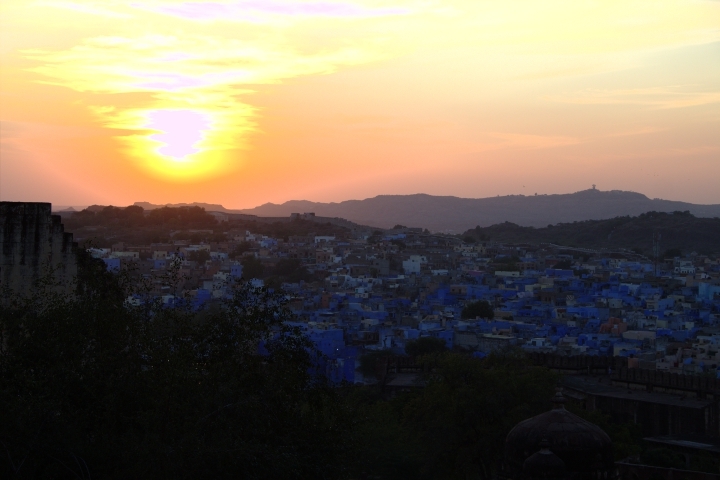 I gaze out over the vast city below; many of the houses and buildings are painted blue, an indication of the class of people living in the dwellings as part of the Indian caste system. It makes for a beautiful scene and is quite serene with the bright blue sky above. I walk around the edge of the fort before making my way back down inside. It seems I’m nearing the end of the journey and I find a few other GE-OS members sitting on a set of stairs in the fort. Together we venture along the final stretches and find a cafe, stopping for a quick bite. After quite a tasty chicken burger, chips and a strawberry milkshake I’m feeling pretty satisfied and ready to head back to the train station. 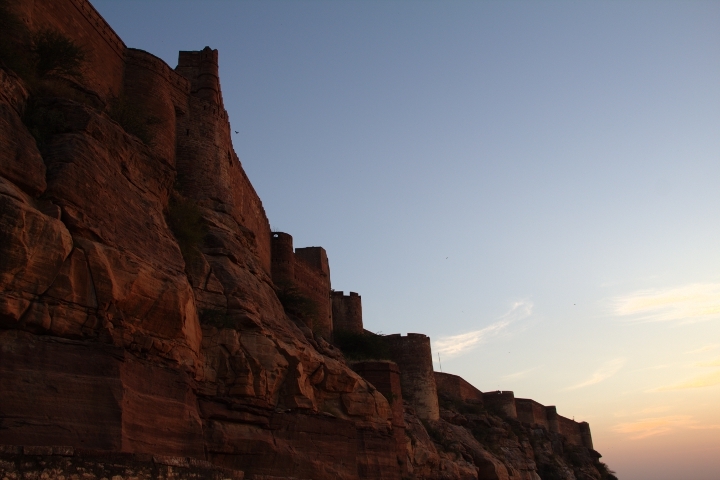 As the sun begins to set over the city of Jodhpur I make my way back down the long streets of the fort, passing through the many stone archways. The mental note I made earlier to try and record the birds pops back into my mind but I realise they are no longer chirping or flying about and am a little disappointed that I’ve missed my chance to get a recording. Continuing on I emerge from the entrance gate to the fort and find myself back outside. The rest of the GE-OS crew are milling about, taking picture of the sunset and waiting for the autos to take us back to the station. – All photos courtesy of Jarad Avnell and Myself. – Lesson: Forts have cannons. You are truly blessed my friend!